I don’t know if the kids in your community are into duct tape programs, or if you’ve been doing it for years and they’re kind of over it. Where I work, duct tape is kind of A Big Deal, and has become one of my most highly attended monthly programs. I started to see the potential a few months ago when we were making wallets, a perennial favorite, repeated again by popular demand. I provided instructions and samples and helped out as needed. I noticed one middle-school girl was making hers rather larger than the prototype, and I felt slightly bad for her and her over-sized wallet that would never fit in a pocket. 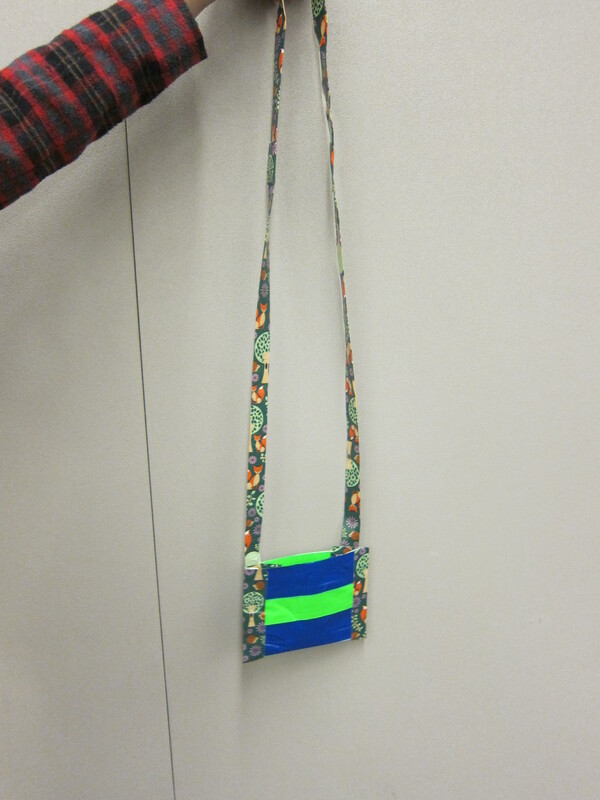 Then she took a long piece of a contrasting color, folded it up and affixed it to the other piece — she had made a cute cross-body purse. I was impressed, as were her peers. This sparked something in the other kids, who increasingly try to make new things or modify the simple project I introduce each month. Here at Robot Test Kitchen, we’ve been open about learning about learning from our problems and even embracing them. I’m at a point where I keep my eyes open for problems and run toward them because they create learning opportunities and keep things so interesting. Duct tape is so perfect in this regard. It sticks to your hands, it sticks to the table, it sticks to itself, and I’ve seen it get stuck in hair. But it is forgiving! Is your project turning out too short or too small? Just add some duct tape. Is it bigger than you’d planned? Cut it with scissors. Has it stuck to itself and everything else and now it’s a mangled sticky ball? Toss it and start over; it’s just duct tape. We have lots more! Working with a duct tape is the perfect metaphor for so much of the STEAM programming we’ve been doing. Unsurprisingly, it’s not about the duct tape or anything we make from it. Our young patrons are not just building wallets or bow ties (which are very cool), they’re building community and building confidence and developing problem-solving skills. Even when we’re not talking about new kinds of programming (hi, robots! ), we can still talk about new ways of approaching our roles, especially in guiding rather than instructing.